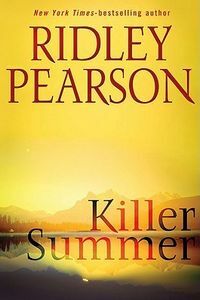 Killer Summer by Ridley Pearson, a Mysterious Review. Review: Ridley Pearson's third mystery to feature Walt Fleming, Killer Summer, has the Sun Valley sheriff trying to prevent the theft of a rare collection of wines that are being auctioned off at an event that has drawn the rich and famous. But why would someone steal something that others assert may be worthless fakes? The wines are a set of three bottles believed to have been presented by Thomas Jefferson to John Adams. Though they have been authenticated by an expert (unfortunately, since murdered), a graduate student who has studied Jefferson's obsessive record keeping with respect to his wine believes they are fake and is determined to prove it. Yet someone seems to think they are real: the courier who brought the bottles to Sun Valley is kidnapped and ultimately dies. Only a chance sighting by Walt of the courier's vehicle, in which the wine was secured, being towed prevents the theft from actually occurring. Walt begins to take extraordinary measures to protect the bottles but also has doubts about both the wine and the purported theft thereof. Sometimes a mystery's plot, characters, inter-character relationships, setting, narrative, and dialogue all come together in perfect harmony to produce an exceptional novel; Killer Summer is one such novel. The story is told from multiple perspectives with occasional overlapping timelines but is never omniscient. Pearson is a master at misdirection here, even to the point of using film references to help steer the readers into guessing (possibly incorrectly) how the plot might unfold. Walt is rather sure that this isn't a simple theft of some rare wine, but he doesn't know the whos, whys, whats, or hows of those involved. Rather than think of them by generic terms (i.e. suspect), he imagines the theft to be worthy of the plot in the film Oceans 11 so calls the leader behind the wine theft "George Clooney". What follows is all rather clever (but really quite impossible to summarize without giving away too much). The view of the terrain from above was wondrous. The ragged landscape of ever-larger mountains and more dense wilderness rose in a progression of deformations like shark's teeth. North and east of Croy Canyon, where Democrat Gulch laid like a dirt ribbon on the valley floor, there was not a structure to be seen. The barren floor of wax weed and rabbit bush gave way to aspen groves, intermingled with fir and lodgepole pine, from where a blanket of green conifers rose toward the jagged rock and the lifeless realms of gravel fields and ice — all that remained above the tree line. Fiona struggled for words to convey her awe, or at least her appreciation, without sounding stupid of overly spiritual. But failing to find any, she raised her camera and recorded the moment instead. "I need to hanger the glider," [Walt] said. "It's light. One person can do it." "Consider this: maybe it's easier with two. You think that's possible?" "I'd appreciate the help," he said. "That's better," she said, moving behind the wing and awaiting instructions. The river had appeared languid, even tranquil, from the raft, like a single sheet of molten gray glass sliding past the dramatic landscape. In the water, it revealed its power and speed. Its cold paralyzing [his] lungs, its unrelenting energy flinging him headlong downstream, the river revealed his attempts at swimming as perilously slight and ineffective. He pulled and kicked against the deceptively strong current while attempting to keep an eye on his destination, some tumbled rocks at the base of a gap in the rock face oiled by a small silver waterfall. There are numerous other examples of fine writing here, from the relationship Walt has with his father and nephew, to the subtle narrative differences when the perspective shifts from an adult to a teenager, to the twists and turns the plot takes as it propels the reader forward. Killer Summer is not only a superb thriller in and of itself, it is one of the best novels of the year. Do not miss it. Acknowledgment: Putnam provided an ARC of Killer Summer for this review.